Arthur K. Wheelock Jr., “Pieter Claesz/Still Life with Peacock Pie/1627,” Dutch Paintings of the Seventeenth Century, NGA Online Editions, https://purl.org/nga/collection/artobject/132271 (accessed April 23, 2019). In this large―more than four feet across―and magnificent banquet piece, Pieter Claesz (1596/97–1660) demonstrates why he was one of the most important still-life painters in Haarlem. A sumptuous feast is set with some of the most extravagant foods available in the Netherlands in the early 17th century. A large peacock pie is festooned with the fowl’s own feathers and gullet—a true delicacy marking only the most special occasions—plus a pink rose placed in its beak. An array of foods surrounds the garnished game, including a cooked bird, olives, lemons, breads, peaches, nuts, and candies. Many of these foods, which Claesz rendered beautifully in pewter platters and Wan-li bowls, were delicacies imported from foreign lands. A small mound of salt, which was itself a precious spice, in a gilded saltcellar adds even more flavor to the meal. Perched at the ready is a berkemeier filled with glistening white wine poured from a pewter pitcher. Painted in 1627, the size of this spectacular banquet feast is critical to its impact. Using life-size pictorial elements, the table top becomes extension of the viewer’s space. Claesz subtly enhances the effect with evidence of human presence―food partially eaten, a napkin crumpled―and precisely captured textures: the pebbly lemon peel cascading from the plate, the shining pewter pitcher, the tablecloth’s crisp folds. He harmonized and animated the scene with subtle shadows and delicate touches of light, as in the light passing through the glass of wine and reflecting on the cloth. This banquet scene was purchased through the Lee and Juliet Folger Fund. I would like to thank Peter Rose, a specialist in seventeenth-century Dutch foods, and Henriette Rahusen, Research Assistant in the Department of Northern Baroque Painting, for their assistance in preparing this entry. Dominating the tabletop is a large peacock pie decorated with the fowl’s own head and neck as well as wings and tail feathers, a showpiece only served on special occasions. This spectacular presentation, which is given added visual prominence by the pink carnation in the peacock’s beak, is complemented by an array of foods, including a roasted pheasant, olives, lemons, breads, shiny red-and-yellow apples, velvety peaches, nuts, and candies. Claesz presented these delicacies, many of which would have been imported from foreign lands, on beautifully rendered pewter platters or in Wan-Li bowls. A small mound of precious salt in a gilded saltcellar provides spice to the meal. Finally, a berkemeier filled with white wine that had been poured from a long-spouted pewter pitcher adds to the banquet’s festive character. For other of Pieter Claesz’s paintings depicting pies decorated with a bird’s neck and feathers, see: Pieter Biesboer, et al. Pieter Claesz: Master of Haarlem Still Life (Zwolle, 2004), nos. 12, 13, 44. Occasionally, such pies appear on the tables of merry company scenes, where elegant revelers enjoy the finer things of life [fig. 1] [fig. 1] Esaias van de Velde, An Elegant Company in a Garden, 1614, oil on panel, Eijk and Rose-Marie van Otterloo Collection. The neck and head would be dried in the oven before being mounted on the pie. It seems unlikely, however, that a peacock pie such as this one would have actually been eaten at a banquet. 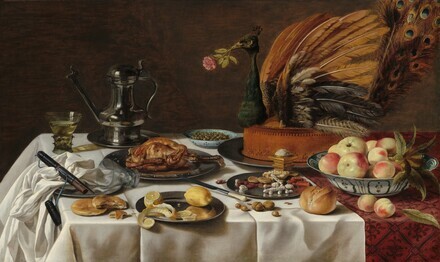 Most likely, it would have remained on the table as a decorative element, surrounded by the other foods, including the centrally positioned roasted pheasant, a much tastier game bird than the peacock. The two paintings were examined side-by-side in the conservation laboratory of the Rijksmuseum, Amsterdam in 2009. Unfortunately, questions of chronological sequence could not be answered on that occasion. Correspondence from Anna Tummers, curator at the Frans Hals Museum, to Jim Mullen, February 6, 2009. These pairs are located at 23.5cm, 34.6 cm, and 56.1 cm from the bottom. This information is contained in an email Joanna Dunn sent to the author on October 10, 2014 (curatorial records). Microscopic examinations reveal that cracks appear in the paint surrounding the notches, indicating that the latter were made after the paint had dried, and hence after the painting had been completed. A few notches, at comparable heights, are found along the right edge of the Rijksmuseum panel, a finding that supports the hypothesis that Claesz used a transfer system (perhaps nothing more than strings crossing the panels at regular intervals) when he created the second version. A somewhat undefined diagonal between the pewter pitcher and the rose in the muted background may be a suggestion of light falling onto the scene from the upper left. A similar effect is also found in the Rijksmuseum painting, but in that instance a clearer distinction exists between the dark area to the left of the diagonal and the lighter wall to its right. The objects on the table cast shadows of varied weight and density, among them the cream-colored shadows caused by light passing through a translucent glass of wine. Particularly remarkable is the array of reflections Claesz captured on the surface of the bulbous-shaped pewter pitcher, including various images of the sunlit window and even the effect of light passing through the berkemeier. Julie Berger Hochstrasser, Still Life and Trade in the Dutch Golden Age (New Haven and London, 2007), 2, 65. Although these biscuits were a common form of daily bread, Hochstrasser emphasizes that the grain for making bread was imported from the Baltic. cut lemon, and crumpled napkin, all of which indicate a human presence. The lemon peel, moreover, falls over the table edge at the very front of the picture plane. Claesz’s ability to capture a wide variety of textures, whether the white crisply ironed linen tablecloth, rough lemon peels, or the reflective surfaces of polished pewter, further enhances the painting’s realistic character. Floris van Dijck and Nicolaes Gillis also used diagonals of the folds of a white tablecloth and a diagonal placement of the knife to draw the viewer’s eye into their paintings, but they did not integrate these pictorial elements as did Pieter Claesz. In their paintings, the knife’s diagonal is opposite those of the folds of the tablecloth, whereas with Claesz they are in the same direction. These diagonals encourage the viewer’s eye to move across the table from one object to another in a measured rhythm, pausing only long enough at each to enjoy its visual delights. For a discussion of vanitas images in Claesz’s early still-life paintings, see Christian Klemm, “Mors ultima linea rerum: Prehistory and foundations of the Skull Vanitas” in Pieter Biesboer, et al. Pieter Claesz: Master of Haarlem Still Life (Zwolle, 2004), 70–90. Instead, this glorious work celebrates the prosperity that the Dutch had achieved through their careful nurturing of the land and their extensive trading network to the far reaches of the world. Large and sumptuous in its presentation, this impressive work would have been hung proudly in a burger’s home as a demonstration of the burgeoning success of the Dutch Republic. Acquired, probably in 1827, by private collector, England; by descent in the family; (sale, Sotheby's, London, 8 July 1999, no. 4); (consortium of dealers, including Otto Nauman, Ltd., New York); sold to James X. Mullen, Boston; purchased 26 November 2013 through (Otto Naumann, Ltd., New York) by NGA. This provenance is given in the 1999 sale catalogue, entry by Martina Brunner-Bulst. The Poetry of Everyday Life: Dutch Paintings in Boston, Museum of Fine Arts, Boston, 2002, unnumbered catalogue, repro. Pieter Claesz: Master of Haarlem Still Life, Frans Hals Museum, Haarlem; Kunsthaus, Zurich; National Gallery of Art, Washington, 2005, not in catalogue (shown only in Washington). The wood was identified by the NGA scientific research department (see report dated November 13, 2015 in NGA conservation department files). comprised of at least three boards. There are two distinct joins, one running through the overturned glass on the table and the other located just below the swell in the top of the pitcher. The original joins were probably attached with an adhesive; however, splines have now been set into the wood to reinforce them. Very likely this reinforcement was added when the wood panel was thinned and attached to a cradle. Covering the surface of the panel, but not the edges, is a very thin, smooth, off-white ground. The paint consists of layers ranging from transparent to totally opaque. Claesz sometimes applied his paint thinly, allowing the ground to play a role in the final image. He used a variety of brushes and manipulated the paint in a range of techniques to mimic or reproduce the textures of the objects on the table. Claesz often formed the shadows by running paint layers into one another and then pulling a small stiff brush into a scallop or wave pattern across the area. He created the diagonal shadow in the background between the pitcher and the flower in the peacock’s beak by moving wet paint aside with his brush. Although he applied some paint wet-into-wet, he mostly painted this image wet-over-dry. Infrared reflectography was performed with a Santa Barbara InSb Focal Plane Array camera fitted with an H astronomy filter. reveals changes around the pitcher at the left and along the left edge of the table. Claesz also initially painted an object under the glass that looks like a blade of some sort. One can also see that the plate under the poultry was fully realized before the roasted fowl was painted. The patterned tablecloth must have been painted after the fruit, since its diagonal decoration does not extend under the fruit. The painting is in very good condition. Two cracks stem from the right edge of the panel toward the center and a crack runs across the entire panel just below the edge of the table. Small cuts and notches into the panel and the paint layers are found along the left, right, and top edges, some of which have been filled and inpainted. Fifteen horizontal cuts and notches are found on the right edge, and eight on the left. One notch has been made at the top, but there are no cuts or notches along the bottom edge. These may have related to a design transfer process. The paint is cracked around these notches, indicating that they were made after the paint had dried. There is inpainting around the edges, along the joins and the cracks, and in scattered other areas. Although there are no major areas of loss or extensive restoration, an L-shaped damage in the paint and ground layers exists on the plate of candies behind the nuts. The varnish layer is somewhat dull here. The painting has not been treated since its acquisition in 2013. Baer, Ronni. The Poetry of Everyday Life: Dutch Paintings in Boston. Exh. cat. Museum of Fine Arts, Boston, 2002: repro. 85. Brunner-Bulst, Martina. Pieter Claesz. : der Hauptmeister des Haarlemer Stillebens im 17. Jahrhundert: kritischer Oeuvrekatalog. Lingen, 2004: 161-164, 218, no. 25. Wheelock, Arthur K, Jr. "The Evolution of the Dutch Painting Collection." National Gallery of Art Bulletin no. 50 (Spring 2014): 2-19, 24, repro. I would like to thank Peter Rose, a specialist in seventeenth-century Dutch foods, and Henriette Rahusen, Research Assistant in the Department of Northern Baroque Painting, for their assistance in preparing this entry. Scott A. Sullivan, The Dutch Gamepiece (Montclair, NJ, 1984), 41–42; and Scott A. Sullivan “Rembrandt’s Self-Portrait with a Dead Bittern,” Art Bulletin 62 (1980): 236–243. For other of Pieter Claesz’s paintings depicting pies decorated with a bird’s neck and feathers, see: Pieter Biesboer, et al. Pieter Claesz: Master of Haarlem Still Life (Zwolle, 2004), nos. 12, 13, 44. The neck and head would be dried in the oven before being mounted on the pie. There are fifteen notches along the right edge and eight notches along the left edge. Some of these have been filled and inpainted. Only one notch is found on the top edge of the Gallery’s panel, and none on its bottom edge. This information is contained in an email Joanna Dunn sent to the author on October 10, 2014 (curatorial records). These pairs are located at 23.5cm, 34.6 cm, and 56.1 cm from the bottom. This information is contained in an email Joanna Dunn sent to the author on October 10, 2014 (curatorial records). A somewhat undefined diagonal between the pewter pitcher and the rose in the muted background may be a suggestion of light falling onto the scene from the upper left. A similar effect is also found in the Rijksmuseum painting, but in that instance a clearer distinction exists between the dark area to the left of the diagonal and the lighter wall to its right. Julie Berger Hochstrasser, Still Life and Trade in the Dutch Golden Age (New Haven and London, 2007), 2, 65. Although these biscuits were a common form of daily bread, Hochstrasser emphasizes that the grain for making bread was imported from the Baltic. The device of including a diagonally placed knife in a tabletop still life has a long history in Netherlandish painting. See, for example, the still life in Joos van Cleve and a collaborator, Madonna and Child, c. 1525, oil on panel, Metropolitan Museum of Art, New York, The Jack and Belle Linsky Collection, 1982.60.47. Knives were often carried around in cases attached to an individual’s belt. The presence of the knife case in this painting indicates that an individual has removed the knife case from his/her belt prior to the meal. For images of people wearing knife cases in the mid-1620s, see: M. Royalton-Kisch, Adriaen van de Venne’s Album in the Department of Prints and Drawings in the British Museum (London, c. 1988), for example folios 71, 73, 79, 82, and 94. I would like to thank Henriette Rahusen for identifying this visual source. Floris van Dijck and Nicolaes Gillis also used diagonals of the folds of a white tablecloth and a diagonal placement of the knife to draw the viewer’s eye into their paintings, but they did not integrate these pictorial elements as did Pieter Claesz. In their paintings, the knife’s diagonal is opposite those of the folds of the tablecloth, whereas with Claesz they are in the same direction. For a discussion of vanitas images in Claesz’s early still-life paintings, see Christian Klemm, “Mors ultima linea rerum: Prehistory and foundations of the Skull Vanitas” in Pieter Biesboer, et al. Pieter Claesz: Master of Haarlem Still Life (Zwolle, 2004), 70–90. The wood was identified by the NGA scientific research department (see report dated November 13, 2015 in NGA conservation department files). Infrared reflectography was performed with a Santa Barbara InSb Focal Plane Array camera fitted with an H astronomy filter.